Greek Roasted Potatoes - easy and delicious roasted potatoes with garlic, oregano, olive oil and red bell peppers. Takes only 20 mins. We have just come back from an amazing Spring Break in Greece. We went to Athens and the paradise island of Santorini. For a week, we were having amazing Greek food and now that I am back, I am so inspired to share some of the dishes I enjoyed with you. Let’s start with something simple like this Greek Roasted Potatoes. Every morning, our hotel offers free breakfast and they served this Greek Roasted Potatoes, which is amazing. It’s a very simple recipe with common ingredients of garlic, olive oil, red bell peppers, salt and paprika, but they are so delicious. I recreated this yesterday and it was a great success and it mimics the same taste I had in Greece. 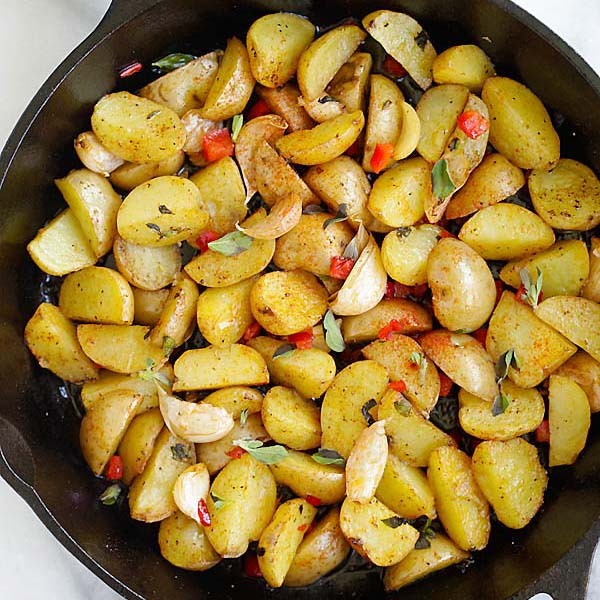 The potatoes are so tender and amazing, with the aroma of oregano and garlic, with just a tint of heat from the red bell peppers and paprika. Try this recipe, it takes 20 minutes. Preheat the oven to 400F. Clean and rinse the baby potatoes, drain and cut into halves or quarters. Heat up an oven-safe skillet (cast-iron preferred) and add the olive oil. Add the potatoes and cook until the surface turns slightly brown. Push the potatoes to one side and saute the garlic, follow by the red pepper, salt, black pepper, paprika and oregano, stir to combine well. Transfer the skillet into the oven, roast for 15 minutes. Remove from oven and serve immediately. I used extremely small baby potatoes. If you have bigger potatoes, roast for 20 minutes or until cooked. You may also roast the potatoes right away in the oven. Just combine the olive oil, garlic, potatoes, Italian seasoning, salt and paprika with the potatoes and follow the remaining steps. Roast for 20 minutes. All photos and recipes on Rasa Malaysia are copyright protected. Please do not use the photos and recipes without prior written permission. If you wish to republish this recipe, please rewrite the recipe in your own words instead of copy and paste and link back to //rasamalaysia.com/greek-roasted-potatoes/. Thank you very much! Ahhh I love Mediterranean flavors. So delicate and delicious.